I Came, I Saw is a microgame in the Strange folder in WarioWare, Inc.: Mega Microgame$!. It reappears as part of Mona's set in WarioWare Gold. The name of this microgame comes from the sentence "I came, I saw, I conquered". 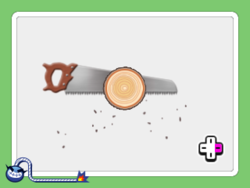 There is a log in the middle of the screen, with a saw next to it. The player must repeatedly press left and right on the control pad to saw through the log and reveal what is inside. 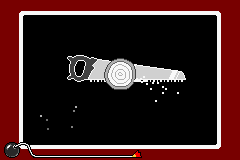 1st level difficulty: The log is small and it takes four presses to cut. A cuckoo is found inside. 2nd level difficulty: The log is medium-sized and it takes six presses to cut. A person with a big white afro is found inside. 3rd level difficulty: The log is big and it takes seven or eight presses to cut. The Baker from Mario Artist: Polygon Studio is found doing push-ups inside. 1st level difficulty: The log is small and it takes four presses to cut. Inside there will be a worm sitting on a chair or toilet. 2nd level difficulty: The log is medium-sized and it takes six presses to cut. A woodpecker will be trying to catch the worm. Otherwise, it will be on a date or sleeping. 3rd level difficulty: The log is big and it takes seven or eight presses to cut. Inside, the worm will be cooking or working out. The man doing sit-ups found in level three in Mega Microgame$! was originally seen in Mario Paint. His design is based on his appearance in Mario Artist: Polygon Studio. This page was last edited on April 4, 2019, at 09:44.